Just in case you thought you were missing out on some crucial aspect of the Nexus 7 2 from Google and Asus, a new press shot has emerged. A tweet from @evleaks revealed the latest spoiler for a device that is going to struggle to surprise anyone anywhere when it makes its long-awaited début. The picture doesn't bring much in the way of extra detail, beyond confirmation of that rear-facing camera, but does give a decent quality view of this next generation device. 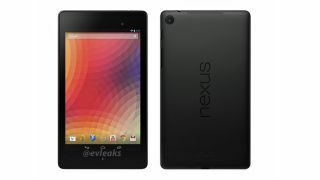 The original Nexus 7 was a real hit for Google and Asus, and is a key competitor at the cheaper end of the tablet market. Now competing with the likes of Amazon's Kindle Fire range and Apple's iPad mini, the Nexus 7 is in need of a refresh and that's exactly what the Nexus 7 2 will bring. We're expecting Android 4.3, dual cameras and wireless charging and a 1.5GHz quad-core processor.